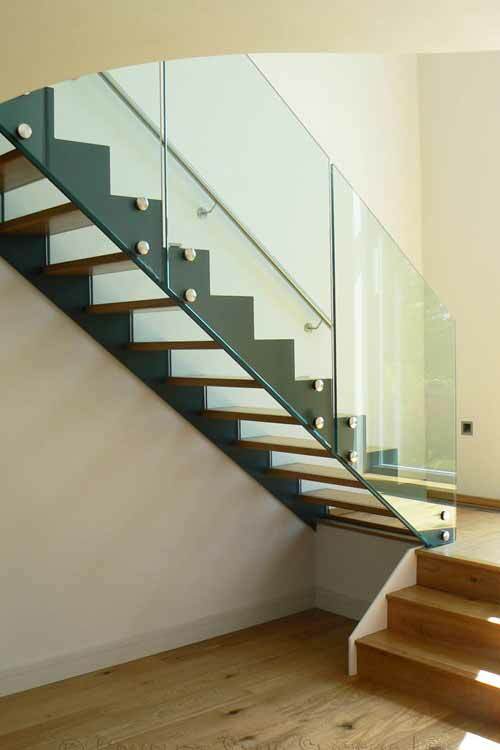 Bespoke half turn staircase with oak treads and handrail, frameless glass balustrade and steel stringers. 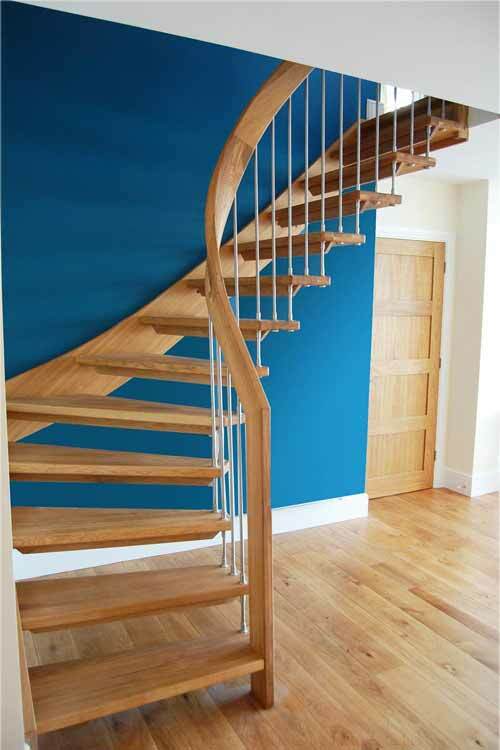 Spirit double spine structure modern stair with oak parquet treads and newels. 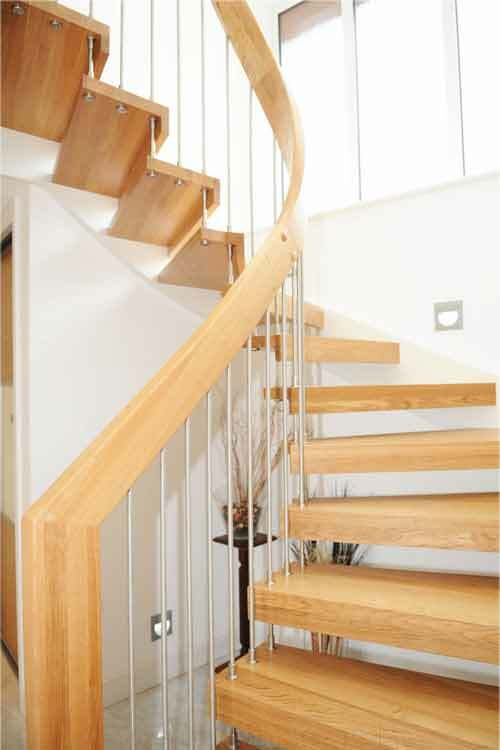 Modern quarter turn flight with stainless steel newel posts, oak treads and cut steel stringers. 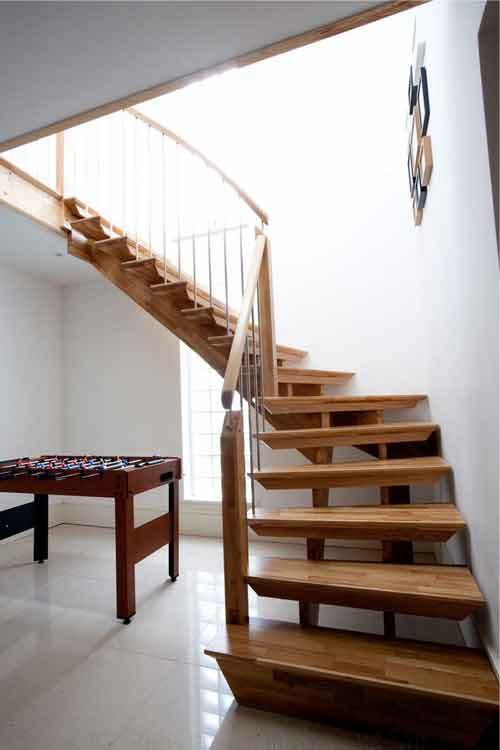 Stunning quarter turn floating timber staircase with a curved handrail and a white wall stringer. 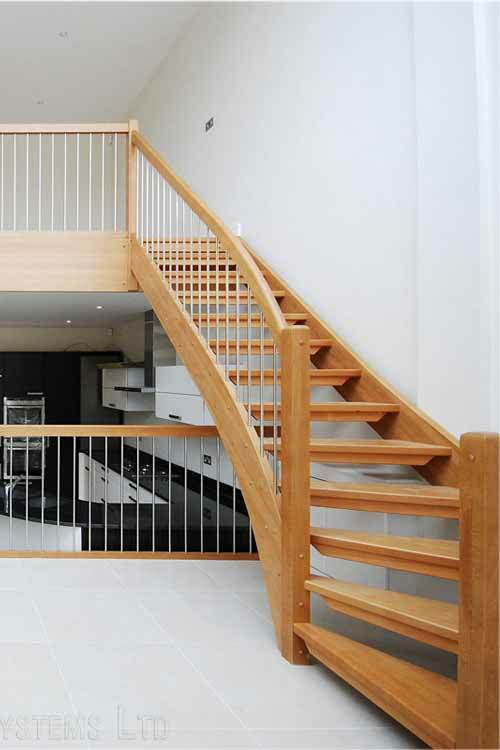 A double flight Oak ‘Spirit’ style staircase with oak treads and modern stainless steel balustrade. 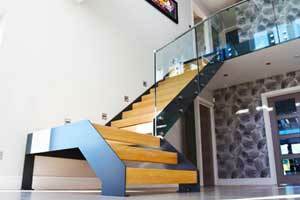 The stairs in our modern staircase range are designed and constructed with a number of innovative support structures. 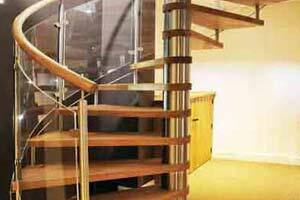 We have steel structure stairs with steel stringers cut in various shapes, and modern versions of traditional timber staircases with floating treads and timber spine. They can all be manufactured in any hardwood and in any configuration. 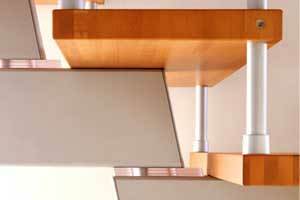 Our range of kit systems offer a very versatile option and cost effective solution for a secondary stair within a house. 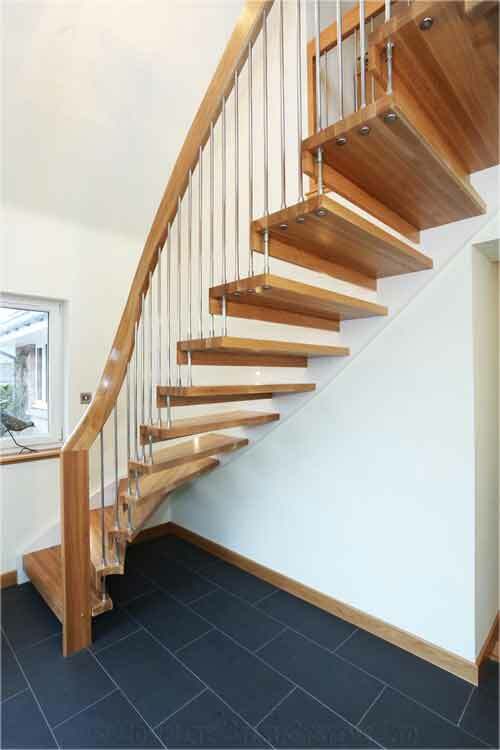 Our popular range of stairs with a steel structure combine a steel support structure and timber treads. 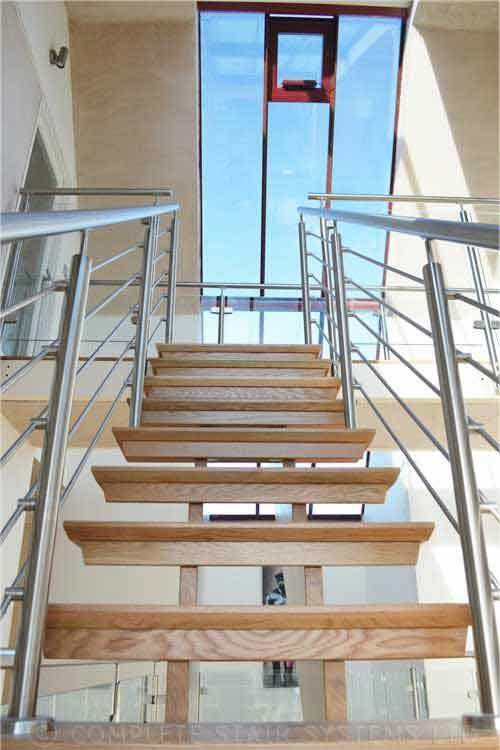 The steel stringers which run either side of the staircase are supplied either as a flat plate or with a zig-zag effect on the top or both top and bottom for a very slick and stylish style. 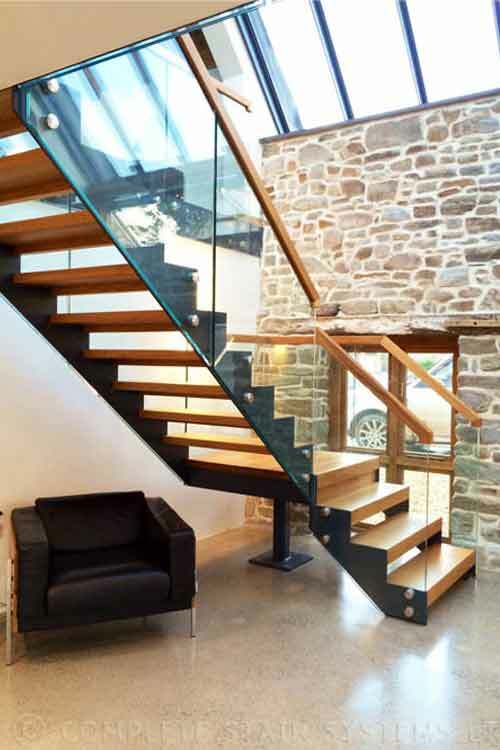 The treads are supplied in any hardwood with oak, beech and walnut being the most popular and the balustrade generally consists of glass panels either fixed between stainless newels or bolted directly to the side of the steel stringer. 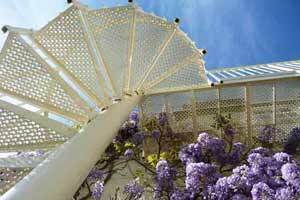 The steel-work is generally powder coated to a RAL colour, or supplied in brushed stainless steel. Treads are often treated with a matt-lacquer finish in the factory, or are sometime oiled depending on our client preference. 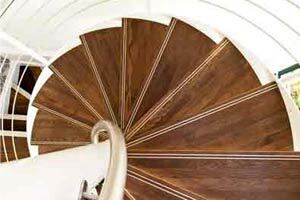 They can also be stained or white waxed to match flooring. This is a custom-made product and each project is carefully drawn before manufacture. 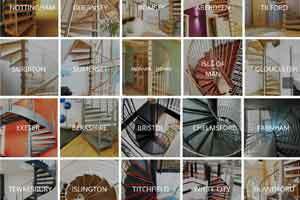 The height, shape, going and width of each flight is unique – the ultimate modern staircase. 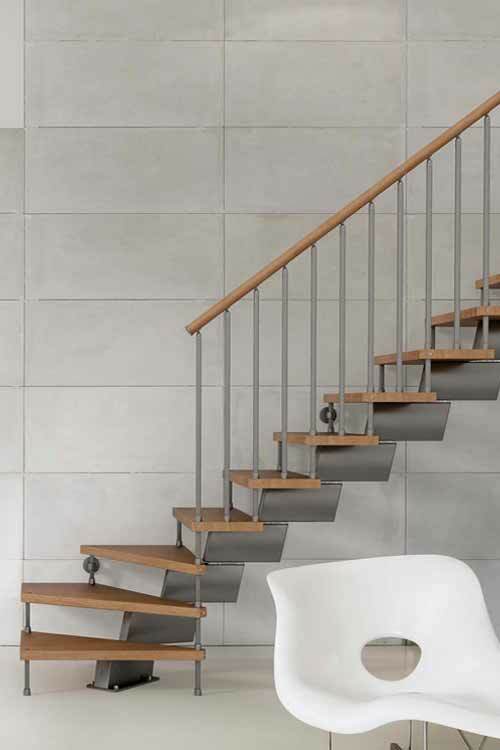 The focus of design is on modern and light styles, with many models supplied with open risers and minimalist materials in an attempt to make the staircase as transparent as possible. 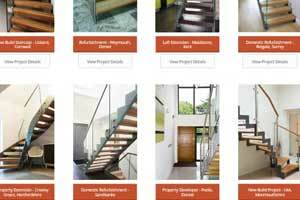 Below are a selection of completed projects to browse through each with a quotation request form at the bottom of the page. 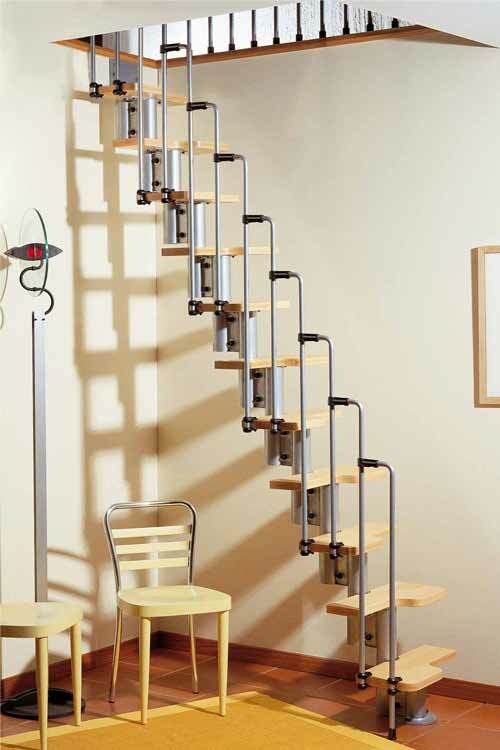 This model is called the WF Staircase, which means without stringer. 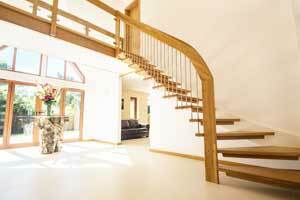 The stair only has a stringer against with the wall with the open side left free, with treads floating in mid-air. This creates a stunning open, cantilevered feel to the flight, making it a very popular choice for renovations and new builds where the passage of light is important. 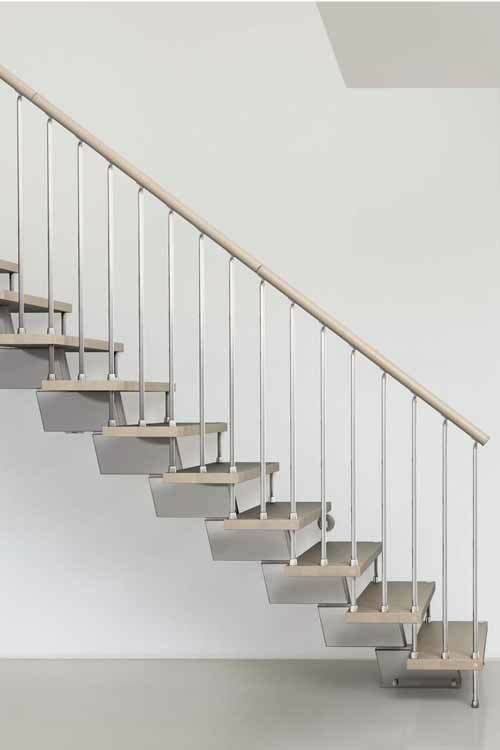 It works with the specially made deep handrail on the open side of the stair, and this actually acts as the ‘stringer’ with the steel spindles screwing up into this – thus transferring the load from the treads. 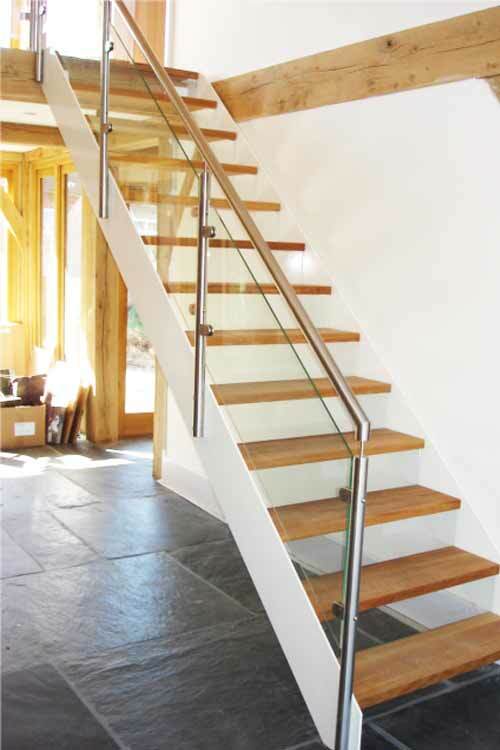 This handrail is bolted to newel posts on the lower and upper levels spreading the load. 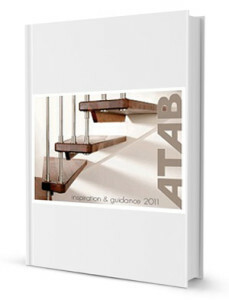 Despite the appearance, the stair is extremely solid and robust and can be manufactured in a variety of configurations. 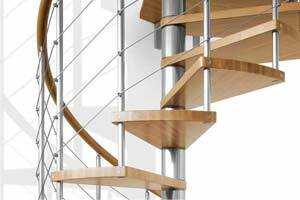 For stability, the system has to be manufactured in hardwood and the spindles are generally brushed or polished stainless steel, although they can also be powder coated or have a timber surround. Many customers choose to have the wall stringer supplied in white so it can be painted on site to blend in with the wall, further emphasising the cantilevered effect. 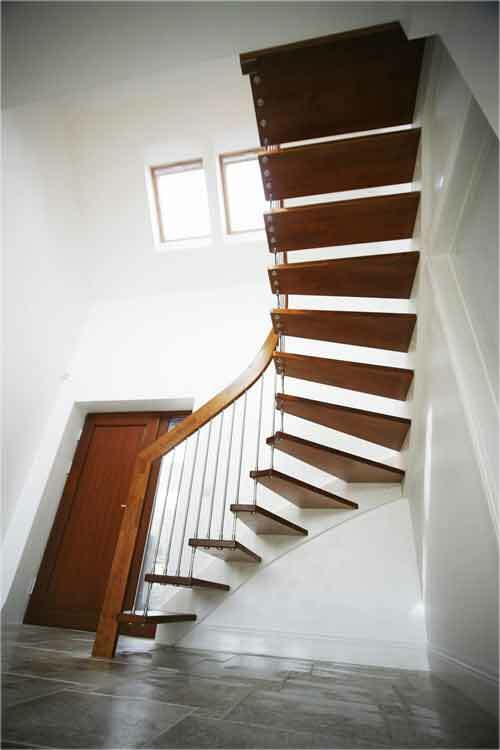 With the half turn and quarter turn staircases, there is an option of having a curved corner handrail, which adds a beautiful swooping feel to the flight and is featured on many of our projects. 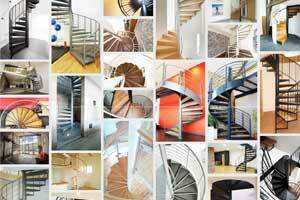 A range of conventional staircases with a modern twist. 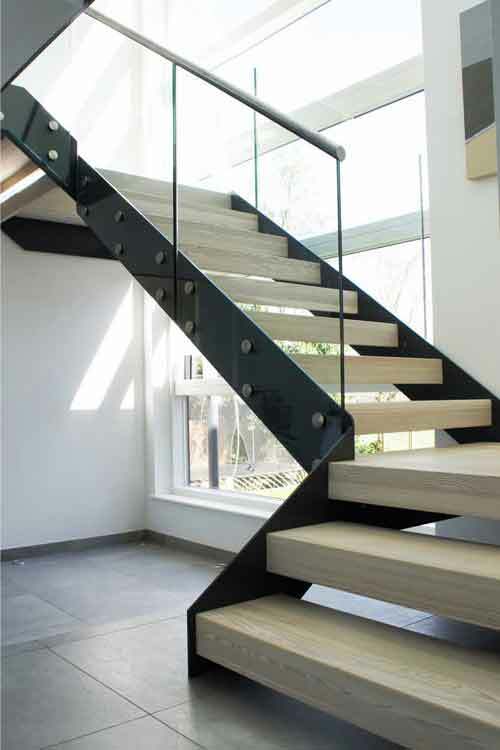 Open risers, glass panels and a unique double spine structure are just some of ways these designs offer a more contemporary approach to a traditional timber stair. 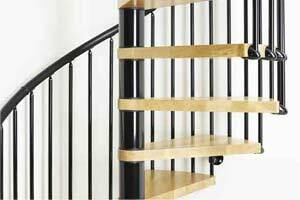 These staircases have a wide range of newel posts, spindles and handrail to choose from as well as a variety of tread profiles to customise the stair. They are manufactured in any timber, can incorporated platforms and can be manufactured in a number of configurations. 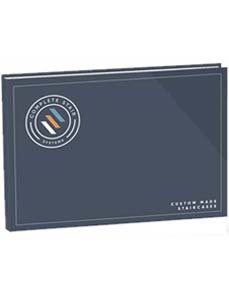 These are custom made specifically for each client. 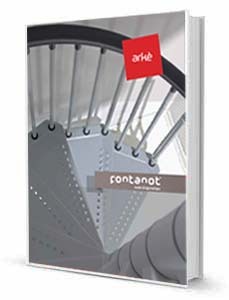 No stair produced is the same with each drawn precisely to match the shape, height and going required for the individual project. 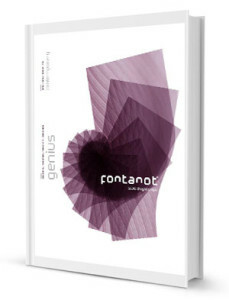 Below you will find a host of project case studies to digest. There is a ‘contact us’ at the bottom of each project to get in touch for your own quotation. 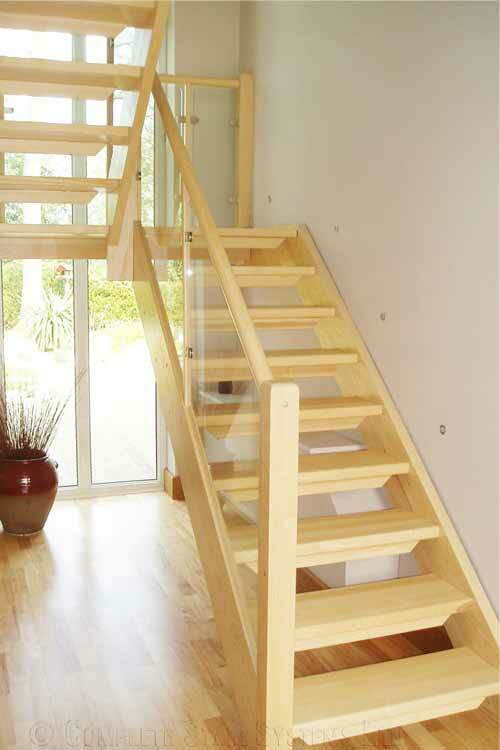 These kit staircase are a great, cost effective solution for a second stair within a home. 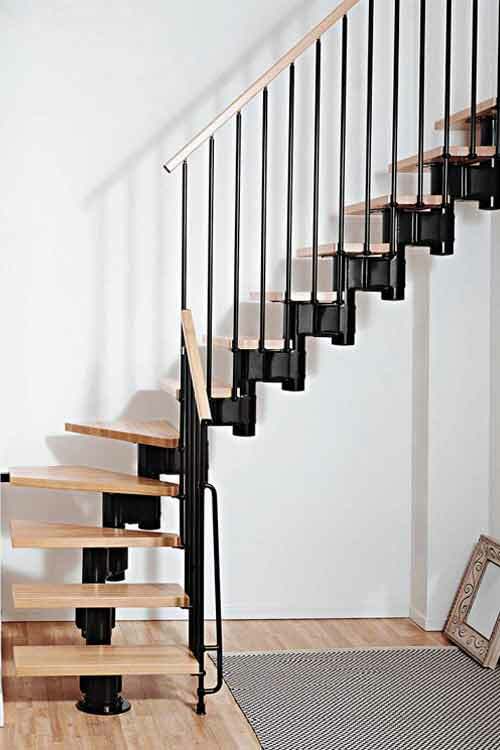 They have a striking modern staircase design with an interlocking steel spine supporting timber treads. Some are available as ‘off-the-shelf’ kits whilst others have certain custom-made elements and further choices of materials and finishes. Many have adjustable riser heights and going depths making them very versatile. Please browse through the range and fill out the form at the bottom of each product page for more information or a quotation.